Not able to find something on the website? Don’t know where to look? Getting answers to your questions have never been so easy. Give users a chance to figure out things by themselves. Users can read the answers to the general question in the form of FAQs(Frequently Asked Questions). The Opencart Accordion FAQ lets you display the framed questions and answers. Users can see the questions and answers in attractive accordion style. This module adds an easy to use FAQ Section to your Opencart store with jQuery powered animation. Beautifully crafted the accordion menu to display the answers. Installation of Opencart Accordion FAQ is simple. In the module zip file, you will find 2 folders. The folders names are admin and catalog. You need to upload admin and catalog folder to root directory of the website. After that in Admin panel go to System -> Users -> Usergroup and edit ‘Administrator’. Now select all for both Access and Modify Permission and save it. After installing the module admin needs to set the layout for the module. 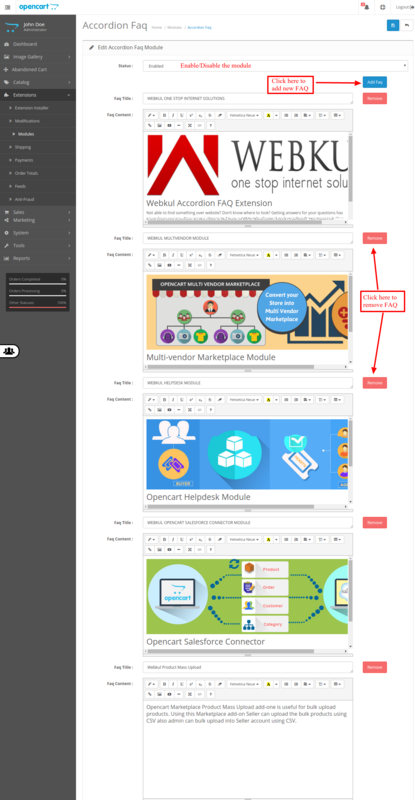 Set the layout for the page on which you want to show the FAQs from System->Design->layout. Now from Extensions->Module click on edit button to enable the module and add FAQ. After saving all the information, you will get an awesome Accordion FAQ to display on your website. The FAQ will show on the bottom of the product page as it was set in the layout. 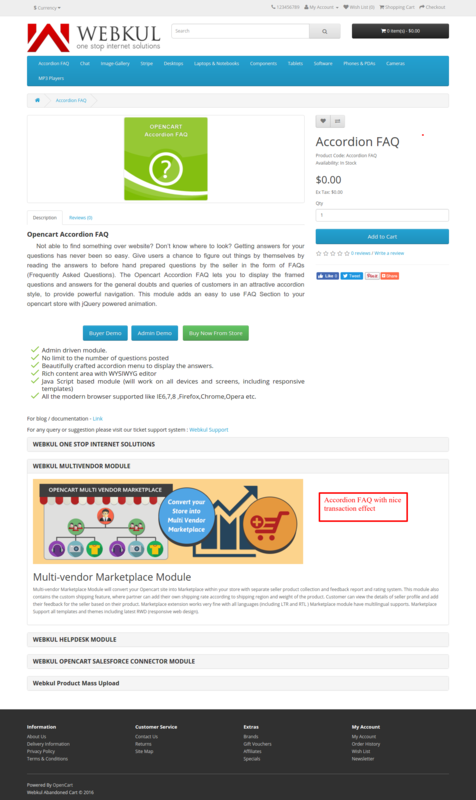 That is all for the Opencart Accordion DAQ version2. If you still have any issue feel free to add a ticket and let us know your views to make the module better at https://webkul.uvdesk.com/.